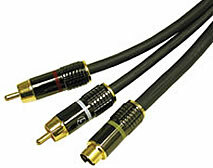 There are 3 Styles of S-Video with RCA Audio Cables on this Page ranging in price for any budget. The differences can be found in the wire, the shielding, gold or nickel connectors, etc. which also determines the price of the cable. Carefully engineered to provide a pure and interference-free conduit for both S-Video and audio signals. S-Video/Audio combination cables are meticulously crafted to ensure full, accurate and interference-free delivery of critical video and audio signals. Silver-plated oxygen-free copper conductors and nitrogen-foamed PE dielectric combine with Cu Shielding Technology™ and a 24K gold-plated connector to provide a lifetime of uncompromised performance. OFC-braided shields are combined with a 100% Mylar® foil wrap to ensure immunity to environmentally-induced noise and guarantee that a completely faithful audio and video signal is delivered to the downstream component. Precision construction techniques ensure maximum stability and fidelity. With Impact Acoustics’ SonicWave S-Video/Audio combination interconnects, you will hear and see all the detail your system can deliver. extended bandwidth PVR products to your home theater system. Velocity™ S-Video Interconnects from Impact Acoustics provide the perfect solution for connecting extended definition video recorders or digital satellite systems to your a/v receiver or television/monitor. Carefully designed dual 75-ohm precision video conductors ensure optimal video quality. Individually shielded Y (luminance) and C (chrominance) conductors are combined with an overall aluminum foil and OFC braid shield to protect against radio frequency interference (RFI) and electromagnetic interference (EMI). 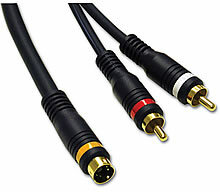 These cost-effective high-performance cables ensure maximum video quality when compared with s-video cables typically included with consumer electronics products. 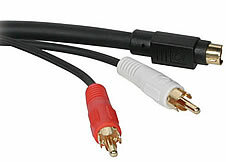 In addition to fitting standard 4-pin S-Video jacks, the Velocity S-video cable fits most 7-pin jacks found on desktop and notebook PC’s with a TV out jack.